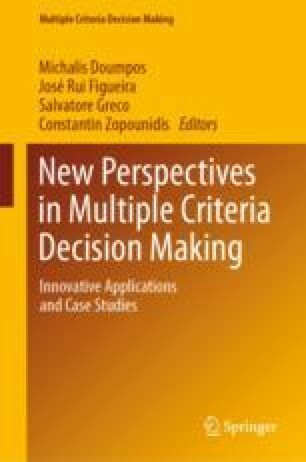 This chapter provides a state-of-the-art account of the use of Sugeno integrals in decision evaluation, when it is difficult to use meaningful figures of merit when assessing the worth of a decision and when only a finite scale of, e.g., linguistic categories, can be used. Here, Sugeno integrals are thought of as idempotent lattice polynomial functions on a finite bounded chain, which makes it possible to assign importance weights to groups of criteria or states. Algebraic and behavioral characterizations of the Sugeno integral are presented and discussed, including the special cases of weighted minima and maxima. Extensions of this framework are also surveyed, namely: lexicographic refinements that increase the discrimination power of this approach; the use of local utility functions in order to cope with criteria having distinct rating scales; and the generalization of the criteria weighting scheme at work in Sugeno integrals. Another kind of extension considered is when ratings belong to a bipolar scale where good and bad figures are explicitly present, thus giving rise to the symmetric Sugeno integral or to the separate evaluation of pros and cons. Moreover, it is pointed out that Sugeno integrals encode decision rules and that this bridge leads to methods for extracting knowledge from qualitative data. The results of empirical studies of the latter are also presented and discussed, accordingly.